Today is New Year’s Eve. I sure hope everyone can look back on this year and have many happy memories. May 2012 bring each of you good health, joy and prosperity. Our family tradition is to take down our Christmas decorations on January 2nd, George’s birthday. Out with the red and green; in with the purple, green and gold. I actually have some friends who take the Christmas decorations off of the tree and replace them with Mardi Gras décor for a Mardi Gras tree. I must say that 2011 was certainly a Facebook year for me. I have made so many good friends via Fac ebook this year and met all kinds of people from everywhere. The garden is still giving. It is unbelievable but wonderful. We have to harvest more peppers and tomatoes today. It’s time to plant celery, which I’ve never grown before and hope it does well. Sometime this coming week the spent plants will be removed and new seeds planted. We have some broccoli seedlings that need to go into the garden soon. This has been a busy week. Everything in our Etsy store is now on sale. As I was putting the items for sale, I was upgrading a lot of things, especially the scarves and adding lots of rhinestones. I still don’t have everything that I’ve made on there but I really want to get rid of some of the items that have been around for a while so that I can make some new items. The sales are good until I take the sale off, which will be in the next couple of days. You should visit the store and browse a bit. I really slashed prices on the majority of the items. The market baskets have been a huge hit this season. So, for the Mardi Gras season I’m doing some market baskets with the Mystic Krewe of Nereids in gold/topaz rhinestones and a couple of cute mermaids in mylar. I think all krewes should have these, especially since we carry so much stuff around. But Krewes aren’t the only people who should have market baskets. Many of my business friends should have them, too. Not only is it a fabulously unique way to advertise by having your company name embroidered on the basket, but these baskets are perfect when you are carrying your wares around, like Avon, Mary Kay, soaps, oils, embroidery, etc. You know each year I give my krewe members the same but special gifts for their birthdays. One year I gave them personalized mermaid pillowcases; last year it was personalized mermaid bath towels. This year I have something else special but I’m stumped on what design to use. I’ve thought about several things but nothing has really grabbed me. January starts a whole new year and new birthdays, so I better come up with something quick. We were able to get the red aprons at a super discount price during the Christmas season and have sold out. The sale is now closed and instead of $5 per apron, they are now $10.12 each. 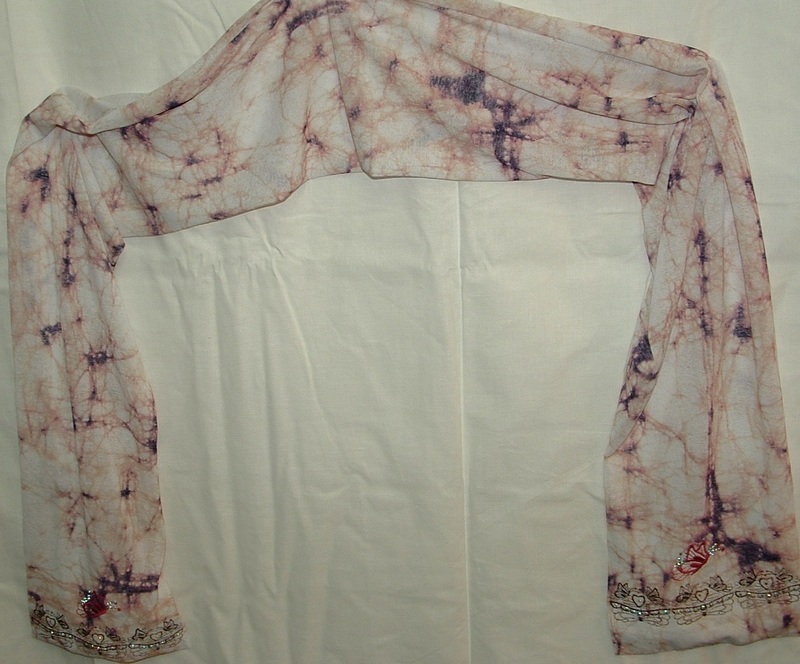 We still have many items in stock that are on sale and have not been listed in our Etsy store. We have tee shirts, polos, jackets, napkins, caps, and other things. Call or email me if you are interested in looking at these items. Boudreaux and Thibodeaux were a couple of drinking buddies who worked as aircraft mechanics at de Estherwood International Airport . Mais one day de airport was fogged in and dey were stuck in de hangar with nuttin' to do. Thibodeaux say, 'Me too. Y'know, I've heard you can drink de jet fuel and get a buzz. So dey pour demselves a couple of glasses of high octane gas and get demselves completely smashed. De next morning Boudreaux wake himsef’ up and is surprised at how darn good he feels. In fack he feels GREAT! NO hangover! NO bad side effects. NUTTIN! Den de phone rings. It's Thibodeaux! 'Have you farted yet?' axes Thib. It is now Christmas Eve Eve. Do you have all of your decorations displayed in your home? Is the tree up and decorated? Have you purchased all of your gifts and wrapped them? Are all of the gifts under the tree? Have you done all of your grocery shopping for Christmas dinner? Are you having turkey or ham? Are you entertaining for Christmas? Or, are you visiting for Christmas? If visiting, do you have a hostess gift? When George and I were first married, we began doing our Christmas shopping the week before Christmas because we both worked and any Christmas bonus that we would get from our employers came right before Christmas. We would take a day and head out to the stores. In the early days, that meant that we had the boys with us. We didn’t have cell phones and internet back then. No shopping online. That last week, and sometimes it was Christmas Eve, we would head out to the malls. Everything would be decorated. Christmas music would be piped in everywhere in the mall. Sure the shelves had been picked over but we always managed to find what we needed. The boys would visit Santa Claus. We would usually go out to eat and make it a festive, if not tiring, day. We did this every year and panicked each year, thinking we may not get everything. As time went by, we began purchasing presents throughout the year, always with the goal of avoiding that last minute present buying extravaganza. One year we actually made it. We had everything done early in the year. You know what? We missed all of the hustle and bustle of last minute shopping. We had actually created a family tradition. So, as long as the boys were living with us, we always made a point of last minute shopping for Christmas. Nowadays, with the internet and online shopping, those last minute shopping extravaganzas are just memories. Instead, we find ourselves hoping this or that present gets delivered in time for Christmas. My, how times have changed. This year we sent very few Christmas cards. Most of our friends and family are sending e-cards instead. I think that’s a great idea, very environmentally-friendly. Although, I wonder what that does to the Hallmark Company. Some aspects of Christmas have changed drastically with technology. Last week’s Mystic Krewe of Nereids Christmas Party was the best ever. As planned, I did spend the night. I think I finally got to bed around 3 a.m. That was a blast. In fact, this entire Christmas season has been a blast. Nothing was planned this past week. We wanted to make sure we were available for last minute orders. It’s been a stay at home week. That’s not to say we didn’t have visitors and customers. We truly enjoyed one of our neighbors dropping by twice this week for wine in the evening and chit chat. I love having company. With all of my newly acquired serving dishes, no one should hesitate visiting us. I decided to do one final harvest this week and picked tomatoes and cayenne peppers. The peppers were boiled with vinegar and water for about a day. At the same time, I boiled and processed the tomatoes. All day I was stopping by the stove to give each pot a good stir with my trusty wooden spoon. No spices were used at all. I stopped at the tomato pot once and tasted and it definitely had the pepper bite to it. It wasn’t hot but you could taste the pepper. At one point I stirred the peppers and just touched my finger to the spoon and then my finger to my mouth. My tongue went numb it was so hot. After cooking everything, I put the peppers in the blender (yes, I was reading recipes) and blended the peppers into a puree. The pepper puree is now in the refrigerator in a glass jar for spicing up food. I instructed George to use only tiny servings. The recipe said that this will keep in the frig for at least a year. I did the same thing with the tomatoes and have a really nice tomato sauce. We may have spaghetti tonight. A look outside of my kitchen and into my garden will show that we have more tomatoes and peppers to harvest. Wow! This has been a great gardening season. In fact, the carrots are looking like they are about ready to be harvested. We also have an eggplant that is ready to be picked and noticed that there are more eggplants growing. This is not eggplant season but don’t tell the plants that. The garden is flourishing and I know in just a week or two it will be over. Didn’t I say that a couple of weeks ago? All of our Christmas orders have been done and the last customer is dropping by today to pick up her package. We have a few orders remaining but those are not for Christmas. A new customer contacted me this week. Her son graduated from college and she wanted to give him some really nice business shirts for Christmas. She contacted the Eddie Bauer Company online and got a couple of very professional white shirts. Whoever she conversed with at Eddie Bauer told her that if she wanted to kick it up to the next level of classy, she should have his initials embroidered on the cuff. Eddie Bauer no longer provides embroidery services for apparel and suggested she find a local embroiderer. 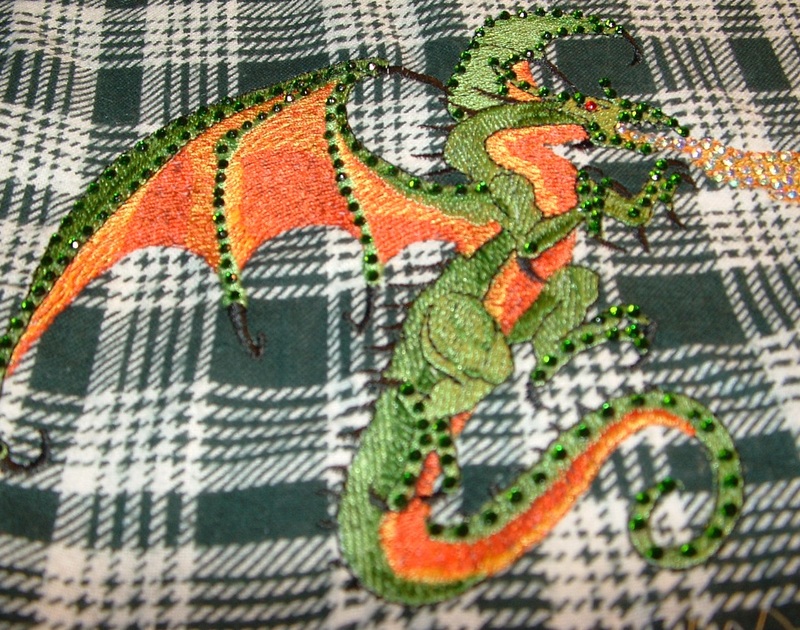 She found Cajun Stitchery via a simple Google search. I reviewed my handy dandy placement guide and found the proper placement for embroidery on cuffs and we were off. We did one in navy blue and one in black; although, you can hardly tell the difference in the colors. She was very pleased and, once again, I made a new friend. Next week, the week after Christmas, is notoriously known for sales. I’ve written before about my friends who have their immediate family Christmas on Christmas day but wait until New Years for their large family gathering so everyone can take advantage of the sales after Christmas. Cajun Stitchery has quite a bit of stock and so we are selling whatever shirts that we have in stock from $5 for short sleeve tee shirts to $10 for polo’s. Napkins are $2 each for napkins in stock. We have ball caps, sweat shirts, jackets and all sorts of stuff that is on sale. If there is anything that you are looking for, email or call and I’ll let you know if we have it in stock and I’ll give you a discount. Or, if you want to come to the house, I’ll be glad to set everything out and let you browse. All of our handmade cell phone holders have been cut drastically, some are only $1.00. In fact, I’m thinking about putting a lot of our handmade items on sale, too, so we can make all new things in 2012. Sorry the market baskets are not on sale but we do have lots of little totes to sell for $2 and some cute purses for $5. If you don’t like our prices, counter-offer. Who knows, you may get me at a very giving moment. As usual, call (850)261-2462 before you come. We always have a pot of coffee brewing. fat and all kinds of stuff"!! His lawyer asks "And which one of those categories do You fit under?" Here we are a little bit more than a week away from Christmas. Do you have all of your shopping done? Are the packages wrapped and under the tree? Have you mailed all of your Christmas cards? Sent the out of town packages? I have done none of that yet. This week has been filled with parties and gatherings. Tonight is the last party on my agenda and it is the biggy. Tonight is the Mystic Krewe of Nereids Christmas Party. I plan to spend the night and return home tomorrow sometime. This has been a wonderful and busy Christmas season. I’m hoping and praying that all of our customers feel that shopping at Cajun Stitchery is a fun and easy shopping experience. A perfect example of the ease of shopping with Cajun Stitchery occurred this week. I was on Facebook doing my usual marketing. I was advertising our market baskets as a means of advertising small businesses with logos embroidered on the side of the baskets. A sweet friend of our’s contacted one of her friends, all on Facebook, saying that she may need one of the market baskets. The lady who became my new friend did not need a market basket but needed a bag to carry her perfumes, which she sells. I happened to have a little carrying case that suited her needs perfectly. The carrying case was black with white polka dots and trimmed in hot pink. She wanted “Got Scents?” embroidered. I explained that although embroiderers do embroider directly on prints, I find that the embroidery usually gets lost in the print. I suggested that she might like to have the “Got Scents?” embroidered on an appliqué patch. She agreed. I created the computer simulated design and posted it for her to see. She loved it and ordered it. Then she asked if I might have a laptop case/satchel to carry her new 17” wide laptop. Most computer cases or briefcases are not wide enough for the newer laptops. As it turned out I did have a black laptop case in stock. She wanted her name embroidered in hot pink using the Chanel font. Another computer simulated design was created, posted and ordered. I sent her a PayPal invoice which she promptly paid. When the order was completed, I posted photographs of the actual items. Yesterday she picked up her order. It was so simple. Of course, anyone can shop online. And shopping online is simple. While shopping online, do you ever have a question about the item? Is there anyone at the store that you can ask? If you went shopping in person, you could ask the salesperson but who do you ask online? If you shop at Cajun Stitchery, you can ask me. Even if I’m not online at the time, you can leave me a message or send me an email and I will answer you promptly. For me, the beauty of this is that I made a new friend. Our customers are not just people who come into a store, get what they want, and leave. Our customers become my friends. And I would never cheat or bamboozle a friend just to make a buck. My friends are people that I care about and I want them to get quality for their money. Now that’s something that you don’t find at Wal-Mart. Speaking of the market baskets, those things are selling like hotcakes. I had to place two orders this week, alone, for them. The solid colored market baskets are $22.00 each. I will embroider a name or initials for $5 with purchase of the market basket. The polka dot baskets are a bit more expensive, $28 each. Yes, they have several designs and prints of market baskets. I sent one of the polka dot baskets to my daughter-in-law for her birthday last week. At our party tonight, we will be exchanging gifts. My gift will be my latest idea on market baskets with bling. The basket is purple. The krewe name outline is embroidered in gold and the outline is filled with green rhinestones. Purple, green and gold. Yes, Mardi Gras season has also begun. I think these market baskets are adorable with Krewe names. I know the members in our krewe are always carrying fabric, decorations, food, and all sorts of things. These baskets are perfect. I have used mine in lieu of my purse and just put a little purse for essentials in the basket. We also exchanged gifts at our Wednesday night party. My present was absolutely perfect. It was a silver colored serving tray with a silver colored spreading knife with a shell for the handle. This will go with my new accumulation of items required for entertaining at home. The gift that I gave was a bottle of wine wrapped in one of our red Merry Christmas aprons with rhinestones. As it happened, the lady who received the gift is a chef. How perfect was that match. Of course, she loved the apron. Last week was the Pensacola Beach Christmas Parade. I remember last year it was so cold. This year was perfect weather. We thought it might rain but it didn’t. It never rains on our parades. The waffle weave robes have also been a big success. The customers who purchased the robes absolutely love them. I noticed that each of the robes had a tag on them which reads “Monarch www.monarchrobe.com”. Apparently this is the retail store. When I matched the style number from our robes with the retail robes, I found that the robes are selling for $60 each, retail. We are selling them for $50.00. We still have all sorts of ready made items in stock, such as napkins, pillowcases, towels, shirts, jackets, totes, etc., plus handmade items that have not been listed in our Etsy Store. Please feel free to come by and look at all of the items for a unique Christmas shopping experience. And if we don’t have what you are look for, we should be able to find it for you. Call first to make sure I’m at home, though. The coffee is always ready at Cajun Stitchery. CHRISTMAS is around the corner. Get that Christmas shopping done now and enjoy the holidays. Shop local and buy made in the USA. 'It is all so beautiful, God,' she replied. 'The sunrises and sunsets are breathtaking, the smells, the sights, everything is wonderful, but I have just one problem..
And Eve went on to tell God that since many other parts of her body came in pairs, such as her limbs, eyes, ears, etc. She felt that having only two breasts might leave her body more 'symmetrically balanced'..
Last night we entertained friends with dinner and a fire in the chininea. I made enough gumbo for an army. The evening was a delight. In fact, George and I worked all day preparing for the evening. I cooked and George cleaned the house and put out the Christmas decorations. We were laughing and saying that if we entertained each week, we would be sure to give the house a good cleaning at least once a week. A couple of friends of mine gave me lovely trays and bake ware for my birthday because they knew that I had begun entertaining at the house. All of that came in very handy yesterday. I even made dessert from scratch. We had an éclair cake. It was actually a no bake recipe that I happened upon and turned out wonderful. You take a 9x13 dish and put a layer of graham crackers down; then you make 2 little boxes of instant vanilla pudding and put a layer of pudding on top of the crackers; then a layer of whipped cream; then another layer of graham crackers, pudding, whipped cream, and top it off with a layer of graham crackers. Then you take 1/3 cup of cocoa and 1 cup of sugar and put that in a saucepan. Add a little vanilla, a stick of butter, and ¼ cup of milk. Bring that to a boil and boil for one minute. Let it cool. Then cover the cake with the chocolate and put in the refrigerator. You want to leave it in the refrigerator long enough for the moisture to soften the graham crackers, about 2 hours. I think I’ve mentioned before that the word éclair is a French word that means lightning. Tomorrow is the beach Christmas parade. I will be an elf, as usual. I sure hope it is not too cold. Last year George and I froze. If you are nearby, please come to our parade tomorrow at 2 p.m. The waffle weave robes came in and to my delight were very high quality. For those readers who have received Cajun Corner for the past 3 years, you know how I have tried to figure out how to purchase quality towels and such on-line. Throughout the existence of Cajun Stitchery, I really have only had one order for towels that was disappointing and that was the first order. Apparently the key is to look at the weight. Since this was my first attempt at purchasing robes, I had my fingers crossed. I had looked at several wholesalers. 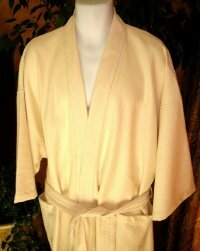 These particular robes come in white and beige, weight is 3 lbs, and they are exquisite. I washed and dried them upon arrival and decided that if anyone else buys one, I’m getting one for myself. You know when you go to a hotel and use one of their robes how it is so warm and comfortable? This is that type of robe. The difference is that this is waffle weave and not terrycloth. When I first heard of waffle weave robes, I thought they were little, light, summertime robes. They are not. They are equally as snuggly and warm as a terrycloth robe. These particular robes are 48” long, one size fits most. They are a cotton/poly blend which I, personally, like because it doesn’t shrink as much. I can always order these robes and sell them for $50 each. It takes about 2 weeks to arrive. Of course, we can always request a rush shipment for an extra fee. 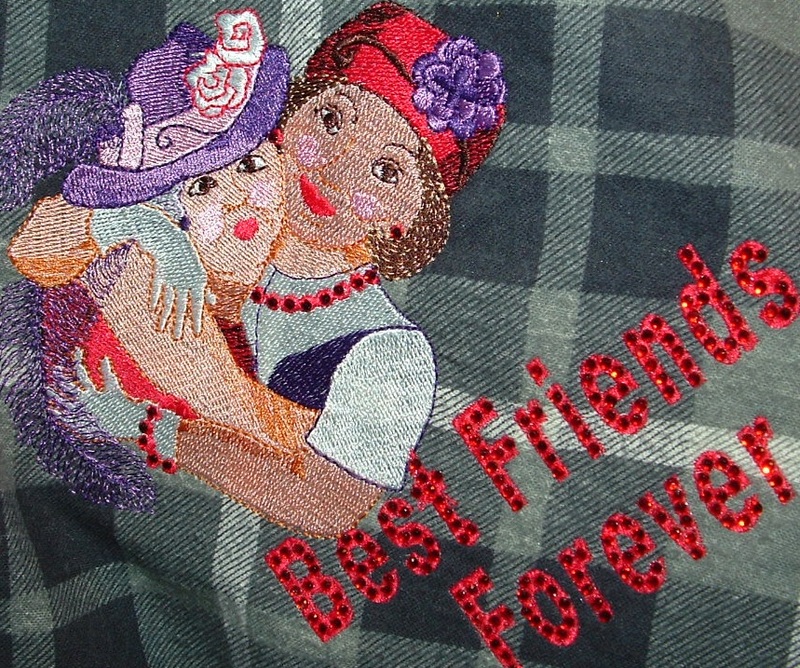 A friend of mine contacted me recently saying she was getting a teenage girl, who she is helping out, a winter jacket and was wondering if we could embroider on it. The girl loves dolphins. I immediately began thinking about the dolphin design that we did on the placemats earlier this year. We wanted to add some bling to it but not too much. I’ve noticed in the professional magazines some over-the-shoulder designs. 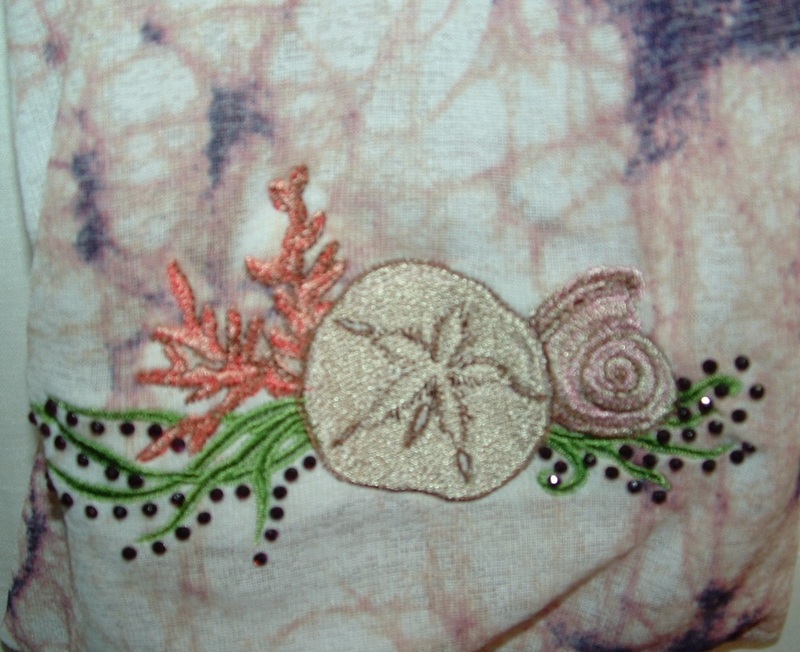 Yes, the embroidery begins in the normal, left chest area and continues over the shoulder. On the back the design can be seen just at the shoulder. It is a really cool technique. The jacket came in and all I can say is Wow, what a cool jacket. It is a blue car coat. She got the jacket from LL Bean. The lining is a fleece jacket that comes out and can be worn when the weather is not freezing or the fleece jacket can snap and zip inside the car coat for a soft lining. We decided to embroider the fleece jacket as well. 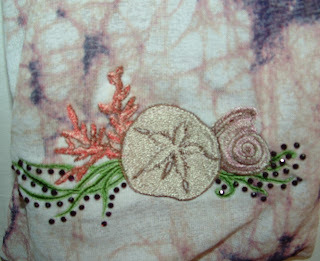 I used the Mylar underneath the embroidery to hold the stitching up on the fleece and give a bit of sparkle. Then I used the same design on the car coat with the Mylar only in the splash area. 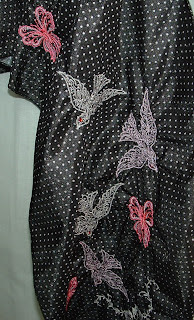 Then we applied rhinestones to the car coat. The pictures don’t do it justice. It was difficult to photograph because it went over the shoulder onto the back. Another fun project that we’ve done this season is the Christmas aprons. One is listed in our Etsy store. They are red aprons with an embroidered Christmas tree and above the tree is “Merry Christmas” done in a candy cane font using green and white thread. Then red rhinestones were applied to the tree. They are really cute and I have an order for another one. They are $20 each, complete with embroidery and rhinestones. The Christmas stockings have been big this year. I’ve made bunches of them. The can wraps have turned out to be a good stocking stuffer or hostess gift. Since LSU and the Saints are having such a good year, the fleur de lis items are going. I can always make more. They are selling for $10 each on Etsy. I will sell them to newsletter recipients for $7 each. Just tell me you saw it in the newsletter. This year’s lagniappe has been seeds. We bought a whole lot of seed packets in the spring to use as lagniappes. We are out of seeds until next spring. I have to be pretty creative coming up with lagniappes right now. Next week is my daughter-in-law’s birthday. I took the last market basket and embroidered it for her. She should receive it today. I sure hope she likes it. I think it turned out really nice. That was the last we had in stock, but I can always get more. The solid colored baskets are $22 each + $5 for name or monogram. We still have all sorts of ready made items in stock, such as napkins, pillowcases, towels, shirts, jackets, totes, etc., plus handmade items that have not been listed in our Etsy Store. Please feel free to come by and look at all of the items for a unique Christmas shopping experience. Call first to make sure I’m at home, though. The coffee is always ready at Cajun Stitchery. "Over here on the swing set," replies the drunk.